I love the mountains of northern Evia, especially the very dark pine forests around the village of Agios Ioannis Rosos. This is probably because I have spent there many of my childhood summers with grandfather Leonidas and grandmother Lily. Since then I remember those little bags hanging from the trunks of the tall pine-trees. I remember my hands stuck with resin and pine needles; I was in such a mess… “Antonakiiiii, come here to wash …” grandmother Lily was shouting. 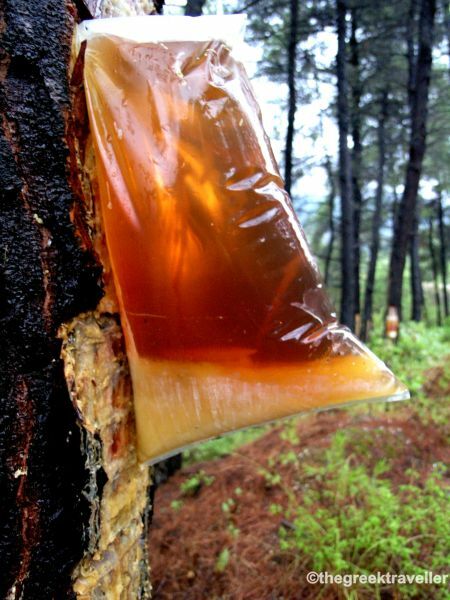 Since then I could not forget the resin from this particular forest,it’s smell, it’s color; I think, I could pick it out from all the resins smells of Greece. Northern Evia is the largest resin producing region of Greece. The prime village of the resin collectors is Kourkouli. 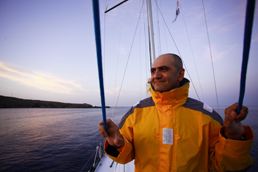 Kourkouli is the village with the biggest – nationwide – resin production: 500 tons a year are produced here! I met in Kourkouli George Alexiou, one of the oldest resin collectors.He invited me at his home, opened a bottle of old raki (highly distlled spirit from grapes), brought appetizers, cheese, olives, whatever he found at the time. Openhearted and jovial, he won me over immediately. “.. Drink, drink Mr. Reporter …” he shouted laughing. And calls his old lady to bring us more tidbits. And I drank… with the warm breeze on the balcony swaying the tops of pine trees stretching before us, an endless deep-green forest blanketing the hills to the east. In a nearby house I heard some folk songs on the radio. Sunday in the village… Near-by, they were also barberquing… A very thick smoke coming from grilled steaks attacked in successive waves our balcony. The trees that are allowed for every family to work with are defined by the Forestry Commission. “Each family has 7-8 thousand trees. You must extract at least 20 tons to live. Just to maintain food for the family… “says George. 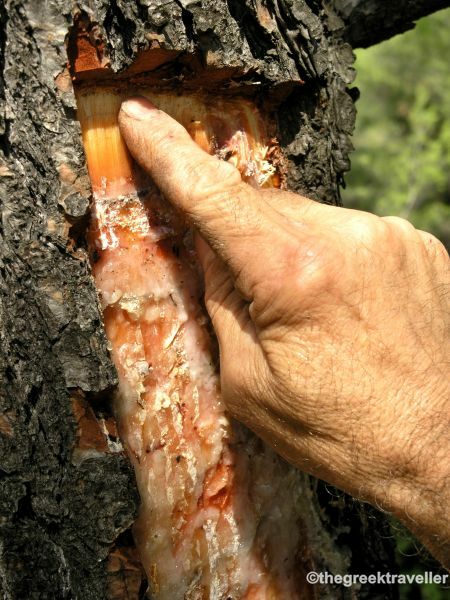 The price of resin is degraded (in 2009 was around 15 cents a kilo!) As only one industry exists in Greece (located at Eleusis, close to Athens) and having a monopoly, it pushes the rates against the collectors. Resin products are turpentine, pitch and a variety of other industrial products. Resin is also used in the pharmaceutical, cosmetics and many other industries. There is certainly a grant for the resin collectors by the European Union. “If there was not a grant we would have ended-up dead by now…” says George. The resin collectors are also given grants because they function as informal forest-rangers: they are in the woods all the time, they clean the places, they work and they keep alert for any fire. Their job is difficult, but they live all year round into the fragrant woods. And this is definetly very nice. It’s like a small reward anyway. I left him near the pines. In the very same woods where I use to play as a kid. Raki makes you see everything nice and simple and I think it’s time I should search for a cold water-tap to cool my head off as I have lots of work ahead of me. 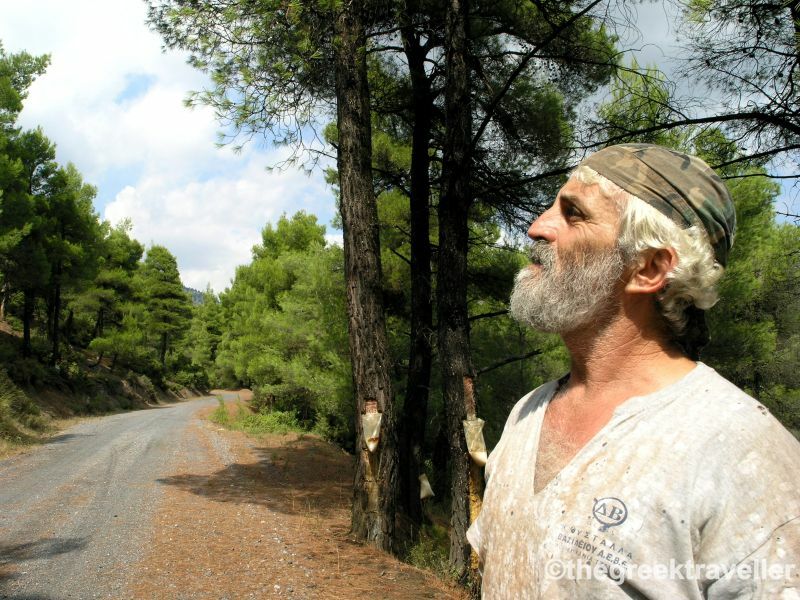 “The forest makes you a good man …” shouts laughing the resin-collector from Kourkouli. Kourkouli village is located between the villages of Limni and Strofylia. All around there are wonderful dirt roads to explore the spectacular pine forests of the region.